After an amazing summer so far, the Labor Day weekend marks the closing days of two of America’s premier racetracks — Saratoga and Del Mar. And, perhaps, the most exciting the thing about closing weekends at both tracks is that both venues showcase the up-and-coming juveniles, who often turn into the top candidates for both the Kentucky Derby and Kentucky Oaks the following year. On Saturday, fillies take the spotlight with the main event in Del Mar being the $300,000 Del Mar Debutante (GI) for fillies and the $350,000 Spinaway Stakes (GI) the main juvenile event at Saratoga. A short field of five is expected to head postward in California, while the connections of 12 fillies will roll the dice in New York. Contested at seven furlongs since 1993 and back on dirt, the Del Mar Debutante absolutely is the race the big connections want to win at the end of the summer before heading back to real life about 100 miles north. Hall of Famer D. Wayne Lukas, who hasn’t had a local stable in many years, has saddled the winner of this event nine times, but two-time Triple Crown winner Bob Baffert is in hot pursuit with seven winners so far and will tighten the girth on the promising maiden winner Mother Mother here. It’s supposed to be a gorgeous weekend again in Del Mar with sunny skies and afternoon highs in the mid-70s all weekend. The rain in Saratoga Springs is expected to take a brief reprieve on Saturday with partly cloudy skies forecasted and a high near 80. Since it was first contested in 1951, some very familiar fillies have made it to the Del Mar Debutante winner’s circle, including Terlingua (1978), who is better known as the dam of the great sire Storm Cat; the ill-fated champion Landaluce (1982); Sharp Cat (1996), a multiple Grade 1-winning millionaire; Chilukki (1999), who would go on to win the division’s Eclipse Award that year; and many more. And since Brave Raj, the inaugural Breeders’ Cup Juvenile Fillies (GI) winner cruised home to win the Debutante under Laffit Pincay Jr. in 1984, some historically significant girls have won the race before going on to win on Racing’s Championship Day, including Halfbridled (2003), Sweet Catomine (2004), Stardom Bound (2008), She’s a Tiger (won the BC Juvenile Fillies, but was disqualified in 2013), Songbird (2015), Union Strike (2016) and Moonshine Memories last year. This year, Kaleem Shah’s Bellafina is the one to beat off her Sorrento Stakes (GII) score a month ago. Trainer Simon Callaghan and jockey Flavien Prat took this event a year ago with Moonshine Memories and, this year, seem set to take it again with this $800,000 daughter of Quality Road. With speed as her weapon, it’s a good bet she’ll be gunning from her outside post position and, if how she’s training is any indication, she’s going to be tough to beat at a short price. Brill and Mother Mother enter off impressive debut maiden wins, the former for Hall of Famer Jerry Hollendorfer and the latter for Baffert. Brill will love the early pace, as, in her debut, she closed strongly from well back into a hot pace, while Mother Mother will almost certainly be part of it under Joe Talamo, who replaces the red-hot Drayden VanDyke (he elected to ride Brill). Speed-numbers-wise, both are at about the same level and both have been training exceptionally well over the Del Mar track. Pace may be the deciding factor here. Boujie Girl broke her maiden at first asking wearing an $80,000 price tag and came back with a less-than-smooth third in the Sorrento. She’ll definitely like a hotter pace. Watch Me Burn is a half-sister to Oceanside Stakes winner Restrainedvengence and is carrying a two-race win streak into this race, including one where she wore a $50,000 tag. 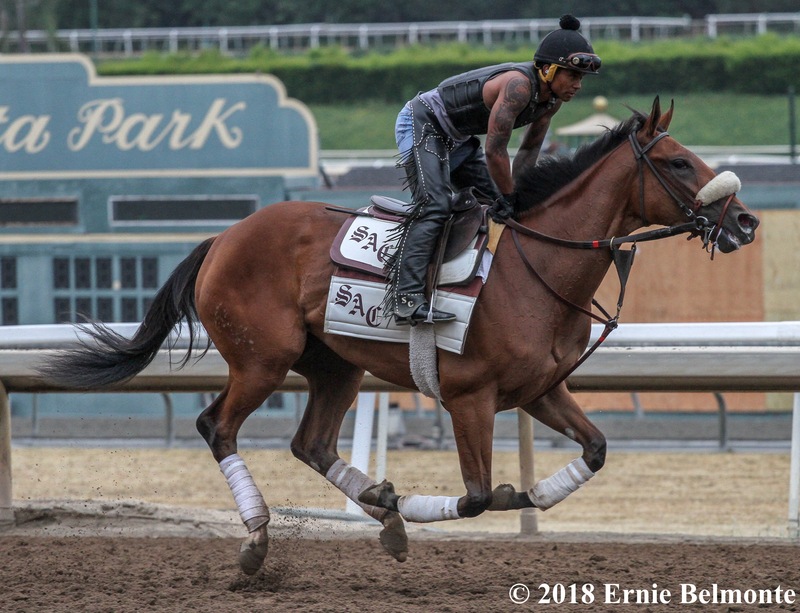 She’s certainly improving, but has been training on the turf for what was expected to be a start in the Del Mar Juvenile Fillies Turf on Monday. 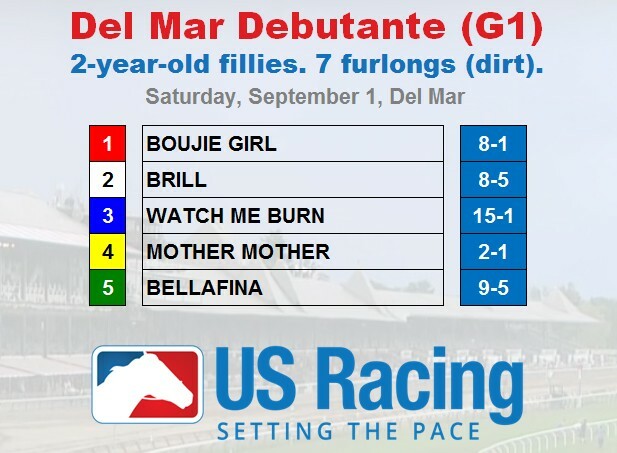 Carded as the fourth race on the card, the Del Mar Debutante is expected to leave the gate at 3:30 p.m. PT. The Spinaway, which has been contested at seven furlongs since 1994 and is again a Breeders’ Cup Challenge “Win & You’re In” event for the Juvenile Fillies this year, also boasts the names of previous winners who were named champions, won a Breeders’ Cup race and/or are in the Hall of Fame. Names like Miss Woodford (1882), Maskette (1908), Top Flight (1931), Cicada (1961), Moccasin (1965), Forward Gal (1970), Numbered Account (1971), La Prevoyante (1972), Ruffian (1974), Flanders (1994), Golden Attraction (1995), Countess Diana (1997), Rachel’s Valentina (2015) and Lady Ivanka a year ago. Todd Pletcher, who is the race’s leading trainer with six winners, sends out a trio of top runners in his quest for another that will likely head to Churchill Downs and the Breeders’ Cup as the favorite from the East. Summer Wind Farm’s homebred Chasing Yesterday, freshened for five weeks since her winning debut at Del Mar back in late July, is the early 5-2 favorite. The half-sister to Triple Crown winner American Pharoah (Tapit-Littleprincessemma, by Yankee Genteleman) looked impressive in her debut under Mike Smith for Baffert, sitting off the hot early pace, to take over in the lane and win by 4 ½ lengths going away, while not exactly hard ridden home. She has room to improve, owns all the necessary connections and though likely a prohibitive favorite, is a solid bet for the win. Schuylerville Stakes (GII) winner Catherinethegreat is the second choice at 7-2 for the Spinaway and the John Oxley-owned/Mark Casse-trained daughter of Uncaptured will surely be part of the early pace scenario under Jose Ortiz. She’s also improving, has some big figures, has been training well over the main track and should handle the extra furlong off her last. Pletcher’s best shot to win his seventh is Nonna Madeleine off her respectable second in the Schuylerville. She did break a bit poorly that day and had a bit of wide trip, so better luck should put her closer to the pace where she seems to like to be. She also has room for improvement and Pletcher’s go-to rider John Velazquez chose her. She has some good works and some better luck may be all she needs. Virginia Eloise was as strong second in the Adirondack last time in an off-the-pace performance and this Pletcher-trained daughter of Curlin should love the added distance. Reflect, who broke her maiden at Santa Anita before finishing fifth in the Sorrento Stakes, ships cross-country for trainer Keith Desormeaux. Overall, her figures fit toward the upper half of the field, but she would need to run several lengths better than she has shown so far to win here. Restless Rider hasn’t raced since late June after winning the Debutante Stakes at Churchill Downs by a whopping 11 lengths. She hasn’t really posted any big numbers, so she’d need to improve a lot here to make a difference. 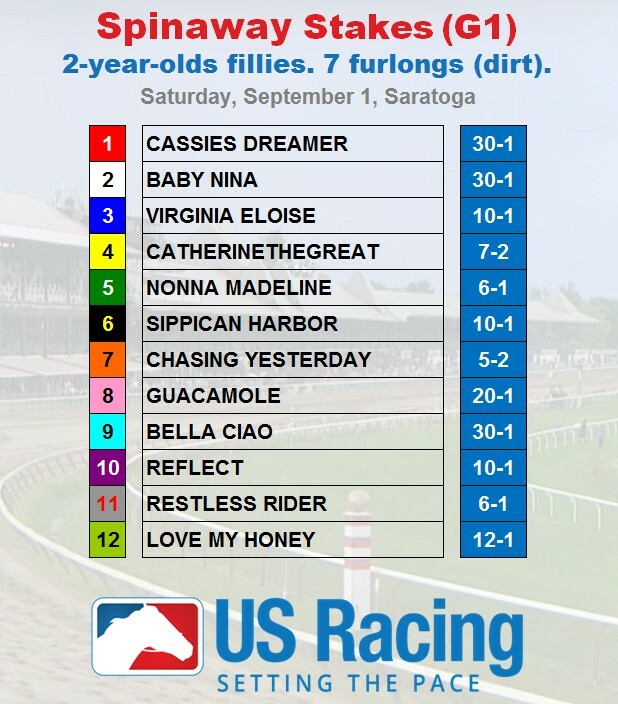 Baby Nina ran a nice race to win the Miss Ohio Stakes at Thistledown six weeks ago, but the numbers she earned are well below what she’d need to beat most of this field. 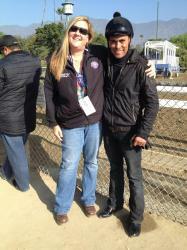 Love My Honey, Bella Ciao, Sippican Harbor and Cassies Dreamer, while all very talented, face winners for the first time. Guacamole is a Grade 2-placed maiden. The Spinaway is Saratoga’s 10th race Saturday with a post time of 6:13 p.m. ET.